Oil on canvas, 22 x 20½ in. It’s rush hour at Crestwood Station. This quaint view of suburban America has it all: a hurried goodbye kiss, a train clacking up to the platform, and a newsboy selling papers to the hustling commuters of Yonkers, New York. Meanwhile, more punctual ladies and gents line the platform three deep. Norman Rockwell’s magazine covers—dependably filled with humor and heart—were more often portraits, intimate and close up. 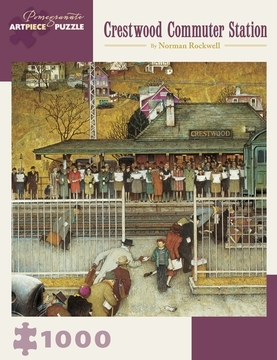 But this rare wide view presents a community in motion, down to the pre-war cars streaming toward the station, where Rockwell (with his pipe) joins the harried commuters racing the train.